"Why We Fight" is an incredible overview of the events leading up to America's involvement in World War II. Master filmmaker Frank Capra was commissioned by the US Army to produce this documentary series to show the soldiers what they were fighting for - and what evils they were fighting against. 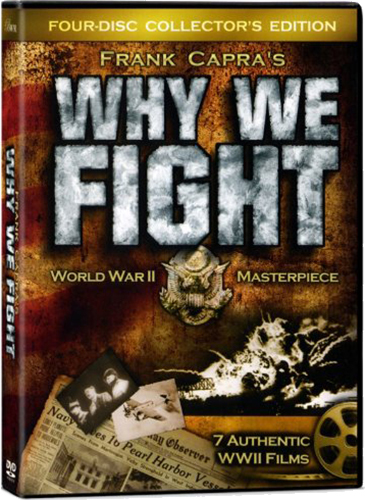 With nearly seven hours of actual footage from WWII, "Why We Fight" adds a new dimension to the study of history - a dimension that books and photos cannot match. Capra gives viewers a greater understanding of the issues, battles, heroes, and villains of WWII as told from America's perspective. The films in this series are as compelling as any war movie, but the battle-weary soldiers and civilians are not actors. The explosions and ensuing destruction are not the product of Hollywood special effects - they're real. Far from perfect, "Why We Fight" stumbles over ideas like religious pluralism and FDR's New Deal. It's proof that history is not neutral - the bias of the teacher (in this case, Capra) shows through. As such, viewers will have their worldviews sharpened if they keep their minds engaged. Our hope in making this series available is that viewers will learn from the past so they can emulate the triumphs of past generations and avoid their mistakes. "I made mistakes in drama. I thought drama was when actors cried. But drama is when the audience cries." The dictionary defines propaganda as a derogatory term for information, especially of a biased or misleading nature, used to promote or publicize a particular political cause or point of view. While the term has acquired a strongly negative connotation by association with its most extreme examples, such as Nazi propaganda used to justify the Holocaust, propaganda in its original sense was neutral, and could refer to uses that were generally positive, such as public health recommendations, signs encouraging citizens to participate in a census or election, or messages encouraging persons to report crimes to law enforcement, among others. Propaganda can be classified as either white, gray or black. White propaganda openly discloses its source. Gray propaganda is ambiguous or non-disclosed. Black propaganda purports to be published by the enemy or someone besides its actual origins. All three were employed during World War II and can be rather easily identified. In Spanish and Portuguese languages, the word propaganda simply refers to the most common form of persuasion and manipulation -- advertising -- which carries no particular connotation per se.